My beautiful sister Niamh is getting married in July to her wonderful French fiancé Francois (or as we like to call him – France-WHAH?! Oh, how we laugh!). As Maid of Honour, it was my duty to host her hen night on Friday the 26th of April. My sister is one of the best people I have ever met in my life. She is one of the kindest, most generous and caring people I have had the pleasure to know. I’m not the only person who thinks so, either. And how lucky am I that she’s actually my sister! So when it came to organising her hen night, I knew all she cared about was having her favourite women in the same room at the same time. It doesn’t happen often as she lives in California and has spent her working life living in Saudi Arabia, the Caribbean, Poland and Dublin. And probably somewhere else that I’ve forgotten. So I knew I could have thrown a party for her in McDonalds and she would genuinely have been thrilled if it meant that everyone would be together. But I couldn’t not go out of my way to do something special for her, could I? No, I certainly could not. Have a look after the jump to see what we got up to. Meanwhile, I had notebooks FULL of scribbled plans for the night, planning everything down to the minute. Mwah mwah mwah! So, on the day, I told her I had managed a small little surprise for her and that she had to be at Trinity College at 7pm sharp with Mum in tow. When she arrived, a group of our cousins were there waiting for her. Once the totes emotes hellos were out of the way, she was shown a video message from her fiancé Francois (France-whah?!) 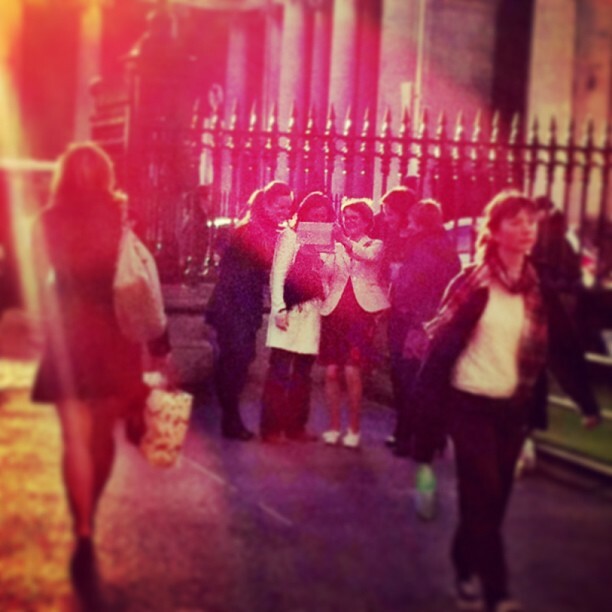 welcoming her to her hen night and sending her on a mini-treasure hunt. Because Nialler is such a legend, he not only designed special menus for the evening but he also secretly followed Niamh on her mini-treasure hunt taking iPhone pics of her surprises along the way. She had to go to the Stag’s Head (the scene of Niamh and Francois’ first date) where some school and work friends were waiting for her. Then they had to go to The Palace Bar (where Niamh took me for my first pint) where the rest of her school friends were waiting for her. They walked around to Westmoreland Street and a hummer was waiting to take them all to my house in Dublin 8. My aunties and other cousins were waiting with me at my house to welcome the hens to Niamh’s Coop, her pop-up restaurant for the evening. My cousins had helped me decorate the room with pictures of Niamh hanging up by twine above borrowed tables that seated 23 people. 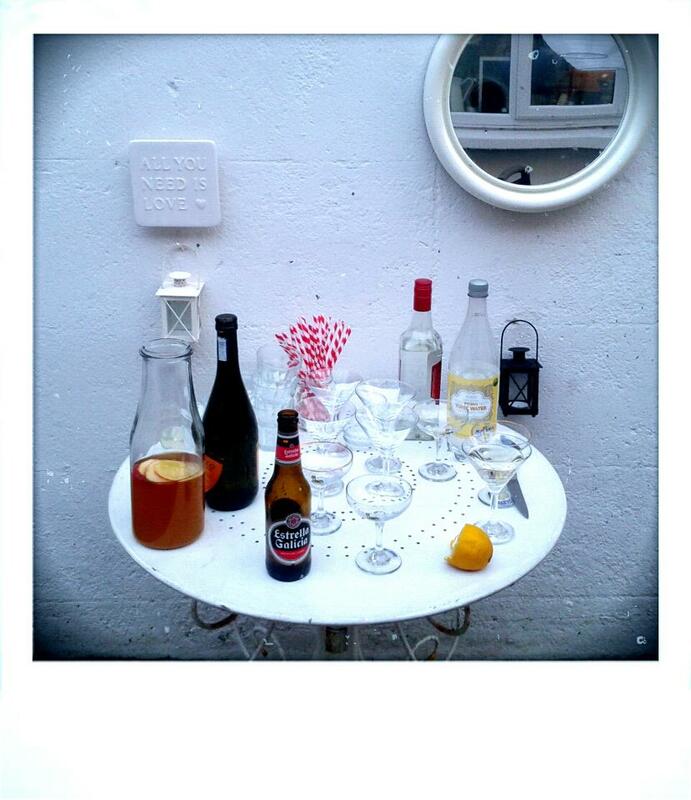 We ushered all the hens into my little back garden and served The NiNi Cocktail – Zubrowka vodka mixed with ginger ale and apple juice. We also had canapés of smoked salmon blinis with mustard and honey creme fraiche and crushed pea crostinis made by whizzing up some frozen peas with ricotta, mint, salt and pepper and topping with salty feta. 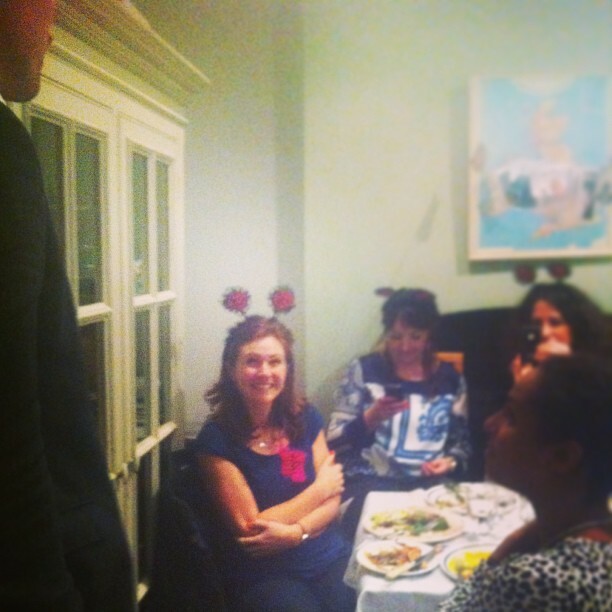 Then we got everyone to sit down (miraculously fitting everyone in my kitchen!) and we served dinner after another special video message from Francois. My Mum and I cooked a meal inspired by my amazing sister’s life. We had beetroot hummus, goat’s cheese and pomegranate dip and roasted aubergine as a kind of Middle Eastern inspired mezze to start. I made a Caribbean Jerk Chicken which we had with salad and Mum’s delicious spinach rice pilaf. For dessert, Mum made her world famous pavlova and my aunts brought lots of their amazingly delicious baked goods. As the final surprise of the evening, my gorgeous friend Robbie (who is my goddaughter Freya’s uncle) took a break from rehearsing for Carmen to come in and sing Eidelweiss from one of Niamh’s favourite movie of all time The Sound of Music. And that’s when the waterworks really started! So as not to push my luck with my lovely neighbours – I had NOT anticipated quite how noisy 23 hens would be, particularly during our group rendition of Doe! A Deer! – I had booked taxis into town at 11.30pm and most of the party moved on to The Workman’s Club, which was the perfect spot to dance away til the early morning. I’m so glad that we were able to pull off a tailored hen for my sister. 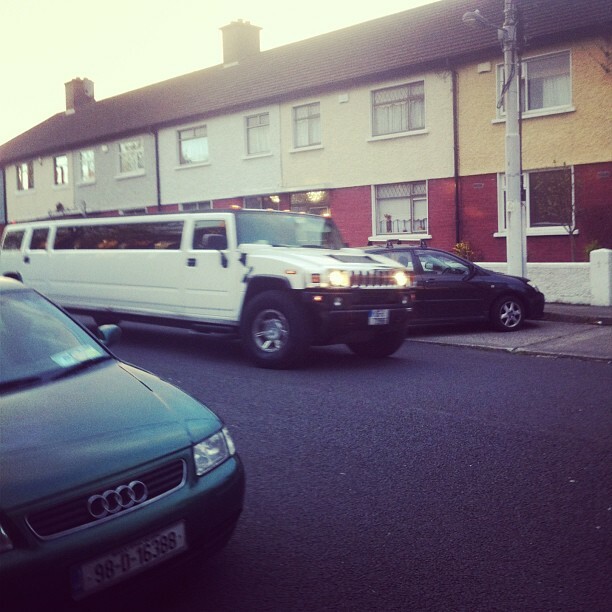 The cherry on top was that we only had to charge the hens €20 each to cover the hummer, drinks and dinner. And I genuinely got such a kick out of cooking for so many people. Apart from being able to delegate to my Mum and having her share the workload by making one of the starters, the rice and all of the desserts (she is so amazing), a major part of the food’s success was the starters and desserts were ready way in advance. The choice of chicken made things very easy too because I had them marinated in their roasting dishes in the fridge for a few hours before the party and it was just a case of whacking them in the oven when the party arrived, re-heating the rice and bunging a few bags of salad leaves into big bowls and making a big batch of honey lemon dressing. I used Jamie Oliver’s Jerk Chicken from his 30 Minute Meals, which I’ve cooked for four people before following the exact recipe below. It’s absolutely delicious. I’m quite bad at maths so when I was quadrupling it or whatever to cater for 23 I got a bit confused and just kind of threw all the ingredients in with wonky measurements but it turned out great! Point is this is a great recipe that’s easily doubled, tripled or quadrupled – as long as you can do the maths! And even if you can’t it doesn’t really matter. Put all of the ingredients, except the chicken, into a food processor. Whizz until you have a thick, green sauce – that’s your jerk! Add a bit of olive oil or a drop of water if you’d like it to be a bit more liquidy. Put the chicken legs into a roasting dish and spread the jerk sauce evenly over the chicken legs. Top with a bit more runny honey and you can even add a squeeze of lemon or lime juice if you like. You can cook it immediately or you can let it marinade for up to 24 hours if you want. Pre-heat your oven to 200c/180c fan/Gas Mark 6 and cook covered with tin foil for 30 minutes. Carefully remove the tin foil and cook the chicken for another 10 minutes or until the skin is crispy and golden and the chicken is cooked through. Serve with green salad and rice (this brilliant yellow rice has become my foolproof recipe). And a nice cold beer. Or Prosecco. Or even A NiNi! Thanks to all the hens who made Niamh’s night so memorable and thanks to my amazing Mum Pauline for all her hard work in helping me pull off my plan and never once saying “WHY CAN’T WE JUST GO TO A REGULAR RESTAURANT LIKE A NORMAL FAMILY?! !” And finally thanks to my sister NiNi for always being there for me and for being such a gorgeous person to throw a party for. Love you! Amazing!!! Sounds like a really special evening. Actually cried reading this. You are the best sister ever. Totally creative and thoughtful. 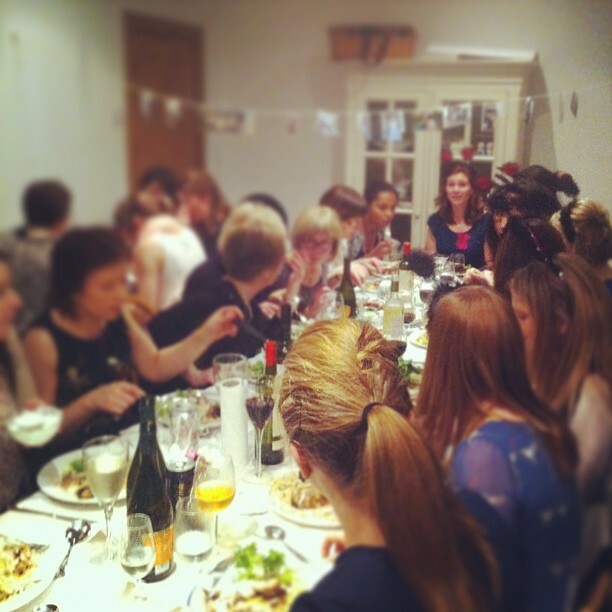 That sounds like the most thoughtful hen party ever and I just loved reading about it! Wow. That sounds like the most lovely hen party ever, well done! Thank you Soracha, it was a lot of fun to plan! What an amazing night! It sounds as though you made it so special for your sister. I had to organise a hen night for me sister too. But it was a bit different… There were 45 people and as a Grease fanatic, she had us all dress as Pink Ladies while she was Sandy! Thanks Sharon! Your Grease night sounds AMAZING, I bet it was awesome fun! What a beautiful post… sisters are so special! 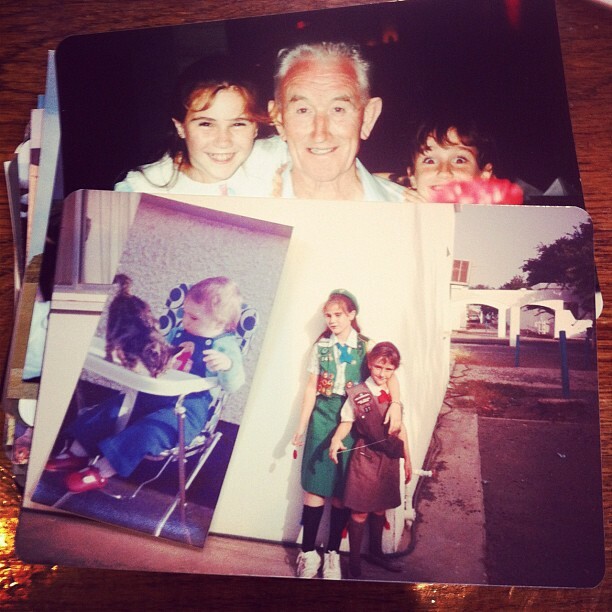 Living in the Middle East I miss seeing my sister and when I visit Ireland the time we spend together is so precious! It looks like a great night was had by all! Niamh (Ni Ni haha) may be the best of all sisters but she is also the best of all daughters-in-law. I’m happy that my son is entering such a fun, united, and warm family. Looks like it was a wonderful evening, you did a great job! 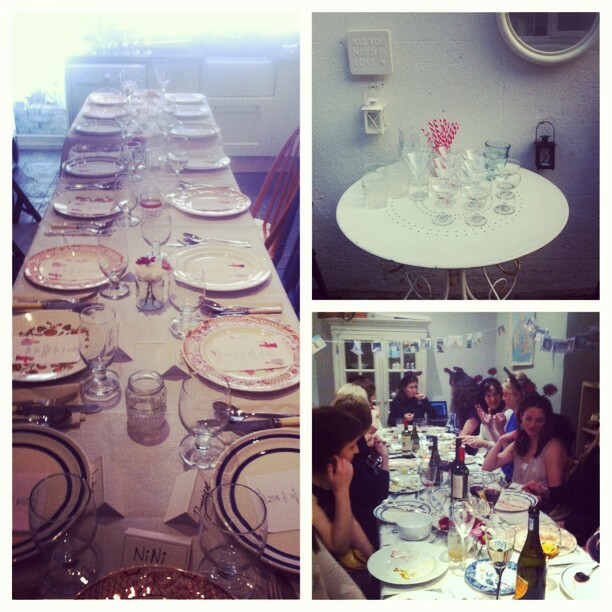 Aoife this is incredibly inspiring…lovely personalised party! Well done!